When you enter in a new user and there are no username or e-mail taken errors, but when you save the person an unexpected error occurs, this will be because the user exist in a different application/site that you are set up to share with on the same server. Sometime users may exist on different sites and you want to add their details to your site. You can do this by importing their correct details into your site. This will enable them to use the same username and password they use on their existing site that that they will be able to use on the site you are adding them to. An Unexpected Error Message will occur if you are adding in a new user to your site, but they exist on a separate Site (e.g they are on smartabase.com/allstars AND you want to add them to smartabase.com/performance). 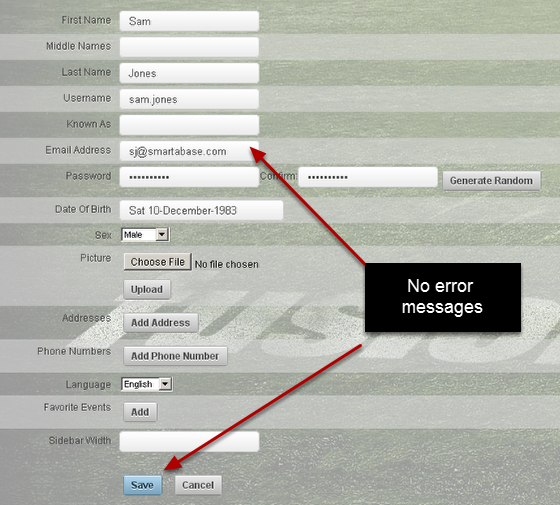 You can see here that on a different site (smartabase.com/allstars), we are adding the SAME user details sam.jones and sj@smartabase.com (from the smartabase.com/performance) .You can see that the username and e-mail are added and no errors appear because they are not an existing user on this new site (on the allstars site). However, when you click "Save" and you will get an unexpected error because they already exist on a different application (see the image in the step below). When you click save for the user, an unexpected error message appears because the user exists on a different site. Prev: Red Error messages when you add a new user?